The above picture shows the amount of gross domestic product produced by the US economy per barrel of oil consumed on a quarterly basis from 1965 through the end of 2011. The data are from the BEA and the EIA and are expressed in $2005. The graph tells an interesting story. Prior to the late 1970s, the US economy used oil very inefficiently (because it had been very cheap for a long time). 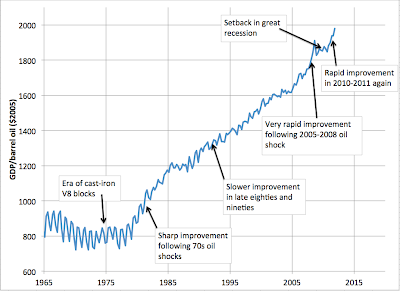 After the oil shocks of 1973 and particularly 1979, oil efficiency began to rise rapidly in the early 1980s. Then it slowed down after the price pressure was off, but continued to rise at a steady moderate pace from the late 1980s through the mid 2000s. 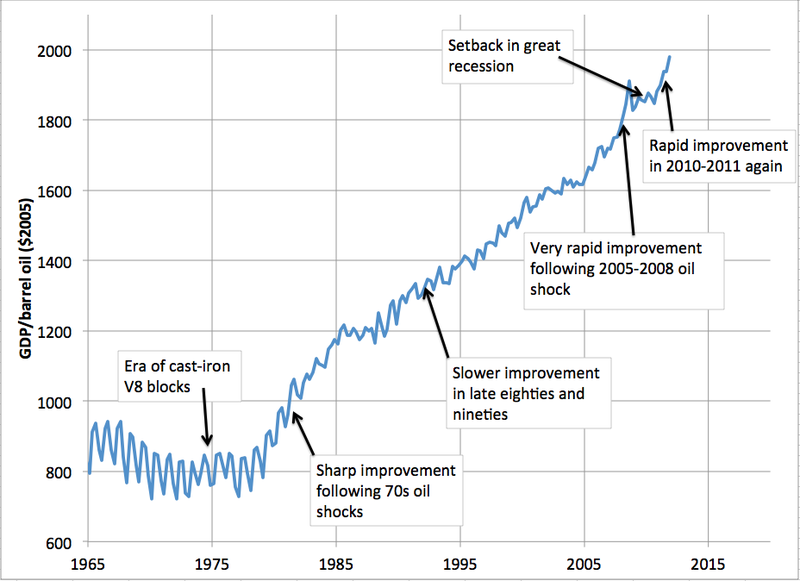 In the later stages of the 2005-2008 oil shock, it rose sharply, but then appeared to be set back by the great recession. Then in 2010-2011 it has again been rising very sharply, presumably under the influence of fairly high prices. Overall, there has been a 150% improvement in this ratio since the lows of the mid 1970s. There has been almost a 25% improvement just since the beginning of 2005. Americans do seem to be slowly getting the message. With sustained high prices, when there is at least modest economic growth, people focus on making their operations use oil more efficiently, and the results are showing up in the national statistics. I've certainly noticed this effect, and I think numerous other people have noted it as well. But a cynic would like to see a graph of the "financialization" of the US economy and see how closely the shape follows the graph you have here. It just seems to me that a graph of the fraction of the economy that is FIRE during the same time period might be enlightening. The 2009 national household travel survey shows average car occupancy at 1.67, the same as in 1990, and down from 1.9 in 1977. Miles per vehicle is down from 12,500 in 1990 to 10,000 in 2009. Vehicle miles travelled per capita is down from 30 in 2001 to 26 in 2009. But being a bit of a cynic, I suspect that a component of this perceived efficiency is likely due to the "financialization" of the US economy, as sunbeam suggested. According to Gail, decoupling of energy consumption and GDP growth can be observed in a number of contries but overall the energy intensity of global GDP remains relatively constant, suggesting that outsourcing of more intense energy consumption (heavy industry for example) may provide the illusion of more efficient GDP growth in certain individual countries. @sunbeam - I agree, I suspect this has much more to do with the measure of GDP and the financialization and globalization of the economy than it does with concrete efficiency improvements. I think most of these efficiency "gains" are fictional, appearing only because we measure the wrong things, and resulting in a weaker overall economy and society. I would love to believe that it is reflective of wide-spread behavioral change, but I see little or no evidence to support that position. Incentive to efficiency doesn't do as much as the carbon tax/market people think. Rather more efficient businesses come along and outcompete the less efficient. And it is a slow process. There's a long way to go to squeeze the efficiency out of the rises we've had. Oh people are changing their behavior somewhat, at least us peon types. But the US has a ways to go to reach even a European level of efficiency. The oil shock associated with Katrina is when I first noticed a change in behavior on the personal level. But considering how this nation is laid out (sprawl, etc) increased personal willingness to conserve doesn't make a big dent. Lucas: I think when it comes to decarbonization, there is a lot to the idea that the developed world has just outsourced a portion of their carbon emissions to Asia. But it's far less clear with respect to oil efficiency, since manufacturing is not particularly oil intensive (it relies on electricity - largely from coal - and process heat - largely from coal or natural gas. Sunbeam - on the financialization thing, see today's post. On Europe - I completely agree that Europe is more oil efficient than the US and the US still has a long way to go. However, it's going to take a long time to erase the benefits of mainly having urbanized in the nineteenth century, rather than mainly during the twentieth century. Urban form changes slowly. Does that chart include converting natural gas over to a barrel of oil equivalent? Starting in the 50' and later the 60's, natural gas became readily available and partially replaced oil as an energy and feed stock source (chemicals). Before that time, the 'gas' that powered your stove was manufactured gas (aka producer gas) produced from cracking coal. It was more carbon monoxide than methane. Why are Gas Prices High?